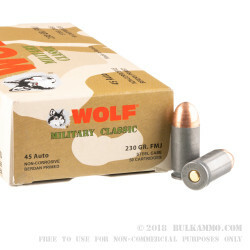 These 45 ACP cartridges from WOLF’s Military Classic line of ammunition are made in Russia, and as such feature the country’s characteristic steel casing. 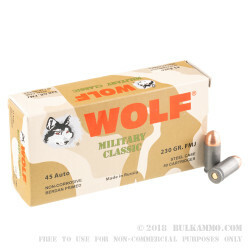 The steel casing’s inability to be reloaded is seen as a plus by Russia’s government, as it makes it easier to keep track of just how much ammo their population owns, but for us its key advantage is its affordability. This casing has a polymer coating which both helps with corrosion resistance as well as reliable feeding and ejection, and the round’s non-corrosive Berdan primer suits the it for long storage. 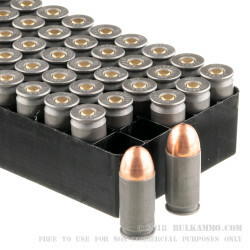 This cartridge also features a 230 grain projectile, which is the caliber’s most common bullet weight. 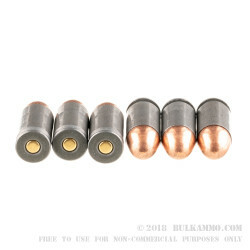 The bullet’s full metal jacket lets it penetrate targets very well, making it a great solution for plinking, and also means you may enjoy more accurate shots before fouling necessitates a good bore brushing.